Encrypt.me Review - Why 56th Out of 78 Tested VPNs? Encrypt.me is like the little VPN relative from StackPath, a giant in enterprise network security. It also used to be called Cloak VPN until just recently, joining them in only April 2016. Today, SlackPath’s goal is to create a “scalable security platform,” including everything from threat detection to prevention and collaboration. So their VPN is just one small piece of a much bigger pie. 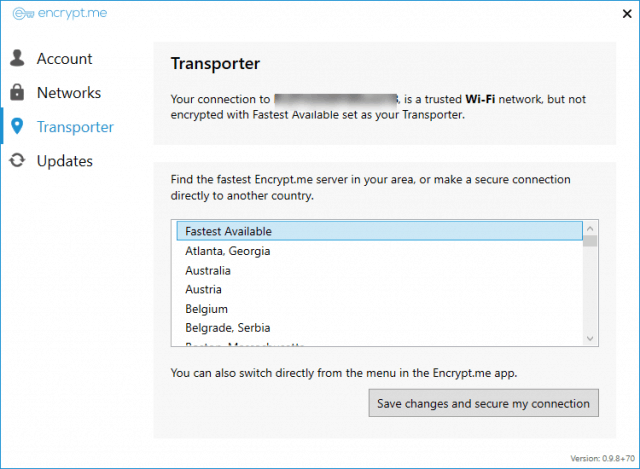 In this Encrypt.me review, we’ll take a look at whether it serves as a critical front-line tool, or whether it’s underfunded and neglected as a result of being the red-headed stepchild to a much bigger security arsenal. Encrypt.me provides a solid, leak-free connection, that’s user-friendly, and even works with Netflix! Keep reading for a complete rundown. DNS leaks unintentionally send out your true physical location, despite having a VPN setup. Your VPN client says you’re connected to a server in New York City, but everyone from your Internet Service Provider (ISP) to the CIA can see where you’re really sitting. Not a big deal for some. But for journalists or activists in authoritarian countries? It can literally be the difference between life and life in jail (or worse). These high stakes are the reason we’ve painstakingly run every single VPN we’ve reviewed (78 and counting) through as many as six different DNS leak tests. But we don’t just stop there. The other hidden danger to look for is potential viruses or malware buried deep inside a VPN’s install files. You download, run the program, and will unwittingly hand over all your data to someone else in the process. Encrypt.me’s install files also passed over 67 checks from VirusTotal.com. So no need to fear. Netflix has gone after VPN users with a new vengeance ever since 2016. Before then, it was easy for expats to fire up their favorite U.S. shows while living abroad. Not only do most VPN connections fail. 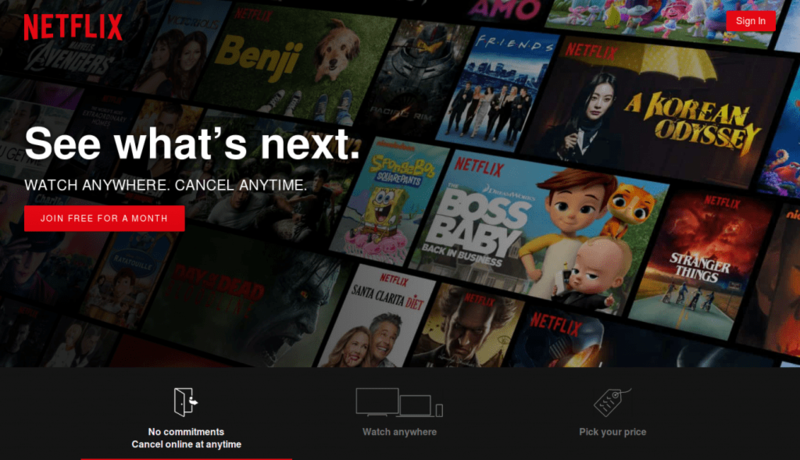 Most are also giving up entirely, throwing in the towel, and telling users not to even bother using their service for Netflix. Unfortunately, this same lesson applies to other streaming services, too. So no Amazon or Hulu, either. Encrypt.me says on their site that they work with Netflix. But we’ve been down this road a time or two (or seventy-four). So we also put them through their paces. We connect to a few different servers and try streaming new Netflix content on each. Netflix worked on two of three Encrypt.me servers! That’s actually really good. It even puts them in the running against some of the other best VPNs for Netflix we’ve reviewed. Encrypt.me uses the IPSec protocol on their iPhone, iPad, and iPod Touch devices (1536-bit minimum DH group encryption). Otherwise, they stick with the industry-standard OpenVPN for their Mac and Android ones (custom-generated 2048-bit DH group encryption). Windows devices run on an open-source protocol called strongSwan, which is an IPsec-based one that works with both the IKEv1 and IKEv2 key exchange protocols. The short answer? They’re all solid. Just stick with their default options, unless you have an old device or slow connection limitations. Encrypt.me can work with all Amazon Kindle Fire devices (on their latest OS 5.0+). Pretty good for most users with simple needs. They even have a kill switch to protect your connections. Users are also allowed unlimited simultaneous connections, which is a major plus. However, power users might not like the following. There are currently no native router or Linux setups. And Tor isn’t supported, either. Instead, they try to upsell Tor-interested consumers to their “Tor Browser Bundle” product. So advanced techies might want to look elsewhere. 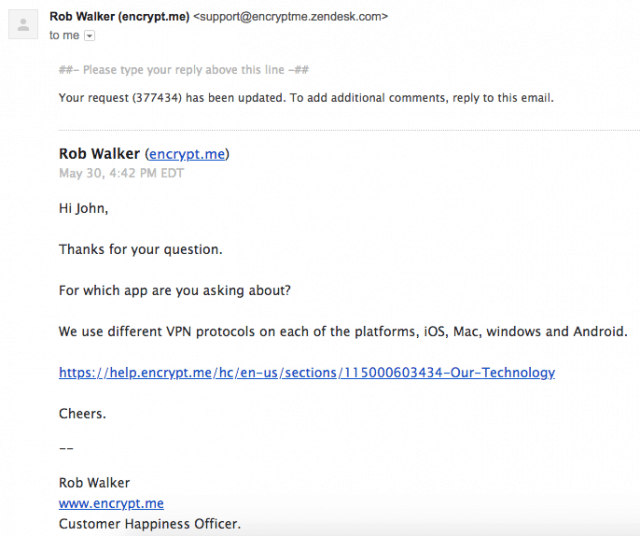 Sticking with their consumer-friendly approach, the Encrypt.me app is also easy to use. Installation on Windows was easy and straightforward. Just click “Install,” and that’s it. The client then started working pretty quickly after, with no major lags or complaints. 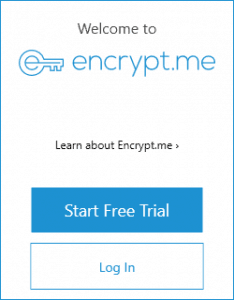 Encrypt.me touts ‘ease of use’ as a major benefit of its apps. And they weren’t joking. When you log on for the first time, the app detects your WiFi connection and classifies it as untrusted. Once you connect, the app is set to automatically turn on every time you connect to an untrusted network. This feature is perfect for people who travel a lot and might use three or four different new connections in a single day. 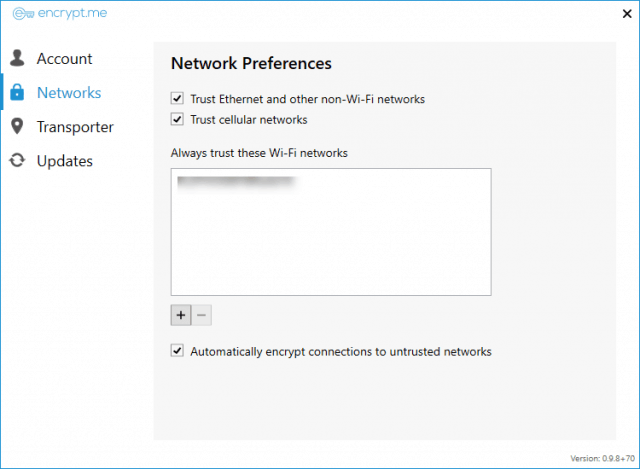 For those connections you trust (like your home WiFi network), you can add them to a list of trusted networks. This means that the app will not connect automatically when you’re connected to a trusted network. Changing servers can be done using two mouse clicks. You can also change the default server you connect to, and untrust ethernet and cellular networks, if you want your connections to those networks automatically encrypted. Technically, the Windows app is still in beta. Everything for us was super stable, though. No major crashes or lags, which we normally see with other beta products. Only one drawback. It did take a little bit of time to connect to a Netherlands server for some reason. We tried others, like New York and Germany, which seemed to work faster. So there might be a few kinks in the Windows system for a little time. Lock-down your connection on unsecure networks. And reportedly, they’re optimizing the entire experience around that. Why is that relevant for torrenting? Because while they technically allow BitTorrent traffic, they heavily block certain sites or use cases. For example, they won’t allow access to any piracy-related sites. So this one is on the fence. Yes, they allow it. But not for the reasons many might be looking for. Encrypt.me delivered the goods across several important categories. They also dropped the ball in a few others. But this isn’t the VPN to illegally download music (or other nefarious activities). They have your “personal session information” for up to a few weeks. And they won’t hesitate to use it (or divulge it). Which brings us to Con #2. Encrypt.me is wholly-owned and operated by StackPath LLC, which is headquartered in Dallas, TX. That means in addition to amazing barbeque, Encrypt.me is also home to the five eyes security allegiance. But unlike the former, the latter is bad news. Your VPN jurisdiction has a huge bearing on your privacy. Select one in a neutral place and you’re good. But choose onside inside the extended Eyes agreement, and you risk exposure to half the countries in the world. A VPN’s local government can and will demand user data if they suspect anything malicious. And that puts them between a rock and a hard place. They’ll almost always give up their user data at the end of the day. They don’t have many other options. When that happens, you might be OK if they don’t log any of your data. In this case, though, Encrypt.me has a few weeks worth on their hands. Which means when the U.S. government comes calling, they’ll give it right over. And every other member of the Eyes alliance now has access to the same information in their database. Let’s tie this back to the first point above now. 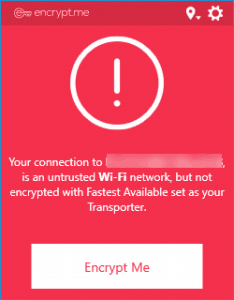 Use Encrypt.me to protect your data on public WiFi connections. But don’t use it for anything that might land you in hot water. Encrypt.me posted a combined 112.74 Mbps speed test across two servers, putting them in 27th place. That’s not bad by any stretch. But it’s definitely average. Here’s how we come up with that number. First, we connect to a server in the EU, and collect both Download and Upload numbers. Next, we connect to another server in another part of the globe to get a fair reading. Generally speaking, you’re always going to see better performance from closer servers. That means connecting to the largest city in your backyard will give you a good reading. While one across the pond won’t. As you can see, not as good. Put the two download speeds together, and compare your averages against everyone else. Encrypt.me has 46 server locations across 24 countries. The total server number isn’t bad, but the country number is on the low side. Remember that last part about your physical location? Here’s where it comes into play. If a VPN doesn’t provide any servers close to you, there’s no other choice than to look across other neighboring countries. In an ideal world, you would avoid that. There’s a good chance your browsing speed might drop from that alone. The other downside is that you risk trying to connect to other overcrowded servers. Chances are, you’re not alone. There are probably others around you in the same predicament. Overcrowded server resources are spread too thin. And now you have another potential speed issue. VPN server numbers aren’t always how they appear. Some companies outright lie about them. But generally speaking, more is better. Encrypt.me has a knowledgebase where you can find your own DIY answers. Just like every other VPN. But also just like every other person, we bypass it as quickly as humanly possible. Instead, we wanted to talk to a real employee of the company. We didn’t see any live chat option. We also didn’t see an official ticket submission process, either. This is where panic started setting in. Thankfully, there is a “Contact Us” link in the upper-right of the main menu. But it just gives you a random email address. So why not. We tried it out. Turns out, this email funnels into ZenDesk. A good sign. And just a few hours later, Rob followed up. Slow, but not the end of the world. Instead of answering my question, he just threw me a FAQ link. HUGE pet peeve. And when you follow that link, there are 21 different Q&As. Yes, I counted them. So, what? Customers are supposed to click on every single one and hunt for the answer now? Encyrpt.me keeps things nice and simple with only two plans for individuals to consider. Both plans offer the same exact access and features. The only difference is that you’re paying for one month ($9.99), or one year ($99.99). Unsurprisingly, you get a nice little discount on the annual plan (saving about ~$20 bucks a year). There are also a few other plans for special circumstances, though. First, they offer a Mini Plan for only $2.99/month. The catch is that you only get 5GB of data on a monthly basis. It won’t last long. But it’s a perfect way for you to dip a toe into VPN waters for the first time. They also offer $3.99 weekly passes on a one-off basis. These come in handy if you’re going on vacation and want to protect yourself on unsecure connections. Otherwise, there are both family and team plans, too. These range anywhere from $12.99/month or $149.99/year for five family members, or $15.98/month for two team members. You can pay with Visa, MasterCard, American Express, Discover, Diners, and JCB credit or debit cards. You can also pay through in-app purchases. But that’s about it, unfortunately. They do not accept prepaid cards or any cash equivalents. They also won’t accept PayPal or Bitcoin (and have no future plans to do so). If you’d like to go for a test drive before purchasing, Encrypt.me does provide a free 14-day trial. No card required. Some VPN terms read like a riot act. They use all manner of legalse to confuse you, or hopefully find a loophole to back out when you ask for a refund. Encyrpt.me’s on the other hand? You can get a full refund within 30 days after paying on their website. If you purchased service through an App Store, like iTunes, for example, you’ll have to go through them (iTunes) to get the refund, because they handle all payment transactions. Do We Recommend Encrypt.me VPN? 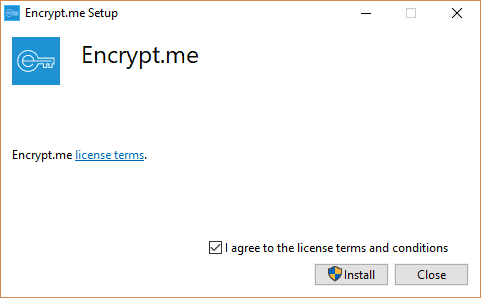 Some of Encrypt.me’s features might be good for beginners. Their unique pricing plans, like the weekly ones, probably make them a good bet for certain types of people. But for other serious users, don’t bother. Most legitimate VPNs will be leak-free, provide easy-to-use apps across most devices, and also work on Netflix. This is table stakes. Otherwise, Encrypt.me’s speeds were just average. They definitely log data and are located inside Five Eyes. Customer support was nonexistent. And they’re not even located in two dozen countries. All of this and their pricing is on the high side, too. Overall, there are much better options available in our Best VPNs Guide to check out. NordVPN is ranked 1st and Surfshark 2nd.